What would you do if somebody tells you that your dream wedding is too wild or too impossible to achieve? Will you fight for your crazy idea or simply give up on it? Susana and Jovany, whose wedding photos have gone viral recently, had a very similar experience. They wanted to get married in the middle of the ocean but were told by a wedding coordinator that it would be too complicated. At first, they thought that perhaps, they should just get married on a beach like what others usually do. Great thing, they met Sol Tamargo of Del Sol Photography. A true lover of water and adventures, Sol was fascinated upon learning about the couple’s dream wedding. Instead of stopping them, she actually encouraged the couple to go for it. She was even thrilled to photograph their big day. “I love the water, any chance I have I tell the people to jump in the water for photographs! 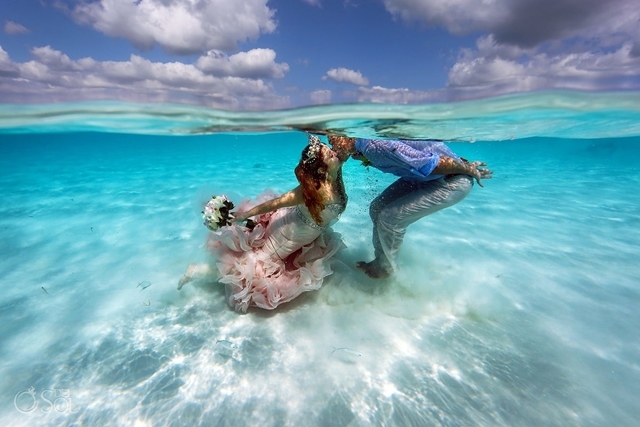 The idea of having a whole wedding ceremony in the water was incredible! I could imagine the amazing visuals. Susana’s vision was a dream come true for her, Jovany and ME!!!! When do you get to photograph a wedding in the ocean, with a surf board and an altar?” Sol said in an article published on their website. Susana and Jovany’s wedding is just a proof that there is no such thing as “too crazy” when it comes to wedding ideas. What matters is that you, as soon-to-weds, are actually prepared to go what it takes to turn your dream wedding into reality. It’s also a great reminder of how important it is to find wedding suppliers who can also see your vision, ready to help you make things happen. Look At This Couple’s Mermaid-Themed Proposal Photos!